Spaghetti and meatballs is probably one of the greatest meals ever. Of course, when I make my spaghetti and meat, I don’t usually take the time to make meatballs. I just brown the ground beef and call it a day. However, my daughter pointed out ever so politely that those were not in fact meatballs. They were meet chunks. Who wants to eat spaghetti and meat chunks? She had a fair point, that sounds pretty darn nasty. So I decided to give meatballs a go, but only if my dear daughter agreed to help. When I say help, I mean she had to do most of the work. We measured the goods together, but she did all the mixing and rolling. I’m not a huge fan of touching ground beef, but apparently my daughter has no such aversion. It turns out the meatballs are extremely easy to make, they freeze wonderfully, and even better, they go in several different recipes that I have on hand. Mix all the goodness together and shape into balls. My daughter did this by hand, but you can absolutely use a cookie scoop too! In fact, I recommend that! 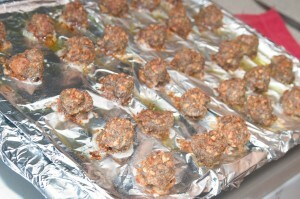 I put the meatballs on a foil-lined pan and place in the broiler until they begin to brown. Half I put into my favorite spaghetti sauce, and the other half I freeze for use in soups, or meatball sandwiches. Yum!